JanaSena Party’s continous fight for Social Balance and everyone’s development needs your support. Just follow the below steps to make a online donation. Step 2 : Then scroll the pages down and click on the “Make a Donation” link. Step 6 : Tick the check box to accept the declaration and click on “Next” button. Step 7 : Next Select a Payment Method and donate your amont. Indian citizens can make their tax-deductible donation to the JanaSena Party from their Indian accounts. Online donation via Net Banking, Credit Card, Debit Card, Wallets (e.g. MobiKwik, Airtel Money, Freecharge,Ola Money etc. ), UPI (Unified Payment Interface), Sending Cheque or Demand Draft. 1. Are my donations eligible for tax deductions? Yes, All donations except cash are eligible for tax deductions under Section 80 GGB / 80 GGC of the Income Tax Act, 1961. 2. Who can donate to Janasena Party? Donor should be an Indian citizen and Residing in India . 3. How do I know that my donation has been received? In case of online donations, a receipt is sent at the registered email address after every successful transaction. For Cheques / DD donations, the receipt is sent by post or hand delivery as the case may be. 4. I have more questions on donations. How do I get more help? One can e-mail us at donations [AT] janasenaparty.org . 5. What payment gateways do you use? we use instamojo payment gateway. 6. Do you store my payment related information? No. Janasena Party does not store payment related information of the donar. 7. I have no transaction number or email but money has been taken from the account. 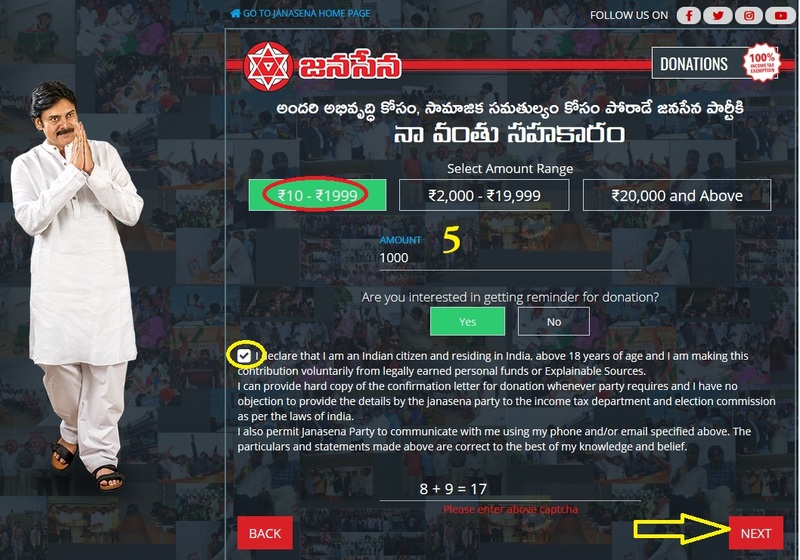 Email us at donations@janasenaparty.org with details such as amount, name of donor, email ID, date of transaction and mode of payment to check with payment gateway provider for further action. 8. I made a donation. I need a receipt for tax filing purposes. Mail us at donations@janasenaparty.org with details such as amount, name of donor, email id, date of transaction and mode of payment for sending receipt to registered email.